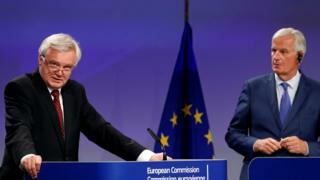 Michel Barnier's urbanity never deserts him of course and David Davis wears his breezy demeanour like armour-plating. But behind their polished podium performances it's clear there are major gaps between the EU and the UK which are not being bridged. Money is the big sticking point of course, although the phraseology around the issue is a little more elegant than that, and the language at these moments can give you a real feel for the underlying atmosphere. Michel Barnier says that after this week "it's clear that the UK doesn't feel legally obliged to honour its obligations". David Davis replies that it's natural that the UK would want to "interrogate rigorously" any demand placed on its taxpayers. But he is also careful to note that Britain is a country that meets its obligations - moral as well as legal; it just expects them to be properly specified. For all the precision and propriety of the language, the distance between the two sides remains significant. Mr Barnier said he detected a certain "nostalgia" in Britain's hope of maintaining some of the benefits of membership. That drew from Mr Davis a sharp reminder not to confuse a belief in the free market with nostalgia. And it was interesting to note how the two men dealt with questions relating to the language in which the whole process is being conducted. Mr Barnier managed to look surprised at the idea that he was "angry or frustrated", arguing that he had displayed the calm you'd expect from a mountaineer. And Mr Davis managed an equally suave dismissal of the idea that he had said his personal approach was one of "creative ambiguity". They were the words of ex-US Secretary of State Henry Kissinger, he said - not his.